Did you know that chlorine exists not only in swimming pools, but also in drinking water and the natural environment? 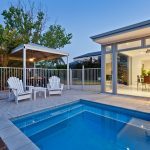 When it comes to handling chlorine pool owners should know the essential facts about chlorine to properly and safely maintain a swimming pool. For example, did you know that a clean pool shouldn’t smell of chemicals at all? In fact, an unsanitary pool usually reeks of chlorine! 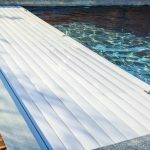 Thus, swimming pool owners need to have a basic understanding of what chlorine is to ensure a sanitary, safe and enjoyable summer pool season. Chlorine, like many other elements, exists as a solid, liquid, and a gas. While the solid state of chlorine usually appears powders and granules, it also exists in other chemical forms. Calcium Hypochlorite is formulated using 65 to 75% chlorine. Chlorinated Isocyanurates, or dry sanitizers commonly used in swimming pools, have varying amounts of chlorine depending on the environment. Lithium Hypochlorite contains about 30 to 35% of chlorine. The liquid state of chlorine known as Sodium Hypochlorite contains 12 to 16% of chlorine. As a comparison of how much chlorine this makes up, household bleaches typically contain only 5% of chlorine. Finally, the most toxic chlorine is gaseous chlorine, which you always need to keep out of reach from children. Homeowners use this chemical as a means to eliminate their pools of harmful bacteria and other germs. This usually occurs in a two-step process. The chlorine first acts as a disinfectant, killing bacteria or algae. Next, it oxidizes, chemically destroying dirt or other foreign materials found in the swimming pool. Did you know each state in the tri-state area requires a chlorine swimming code? State codes ensure that available chlorine residual must be at least 1.0 ppm (part per million) in swimming pools whether in use or not in use. Homeowners can infiltrate chlorine throughout swimming pools using an approved automatic chlorinator. As chlorine seeps into the swimming pool, a weak acid known as Hypochlorous acid permeates throughout the pool. This acid, not the chlorine, facilitates the disinfecting and oxidation processes, which cleans a swimming pool. When filtration and chlorination occurs, a pool’s odor disappears while creating a pristine, clear appearance. As a powerful element, homeowners should use chlorine in small amounts. How Much Chlorine Should You Use? On average, a swimming pool contains anywhere from 3 to 5 ppm of chlorine. To determine exactly how much chlorine you need to effectively sanitize your swimming pool, calculate the size of your swimming pool by how many gallons it holds. As a standard measurement, a swimming pool that is 48 inches tall and 15 feet wide contains 4,978 gallons, whereas an in-ground pool can hold 31,000 gallons or more depending on the length, width, and height. You can also determine the number of gallons your swimming pool can hold by calculating the volume of the pool, then converting that amount into gallons. 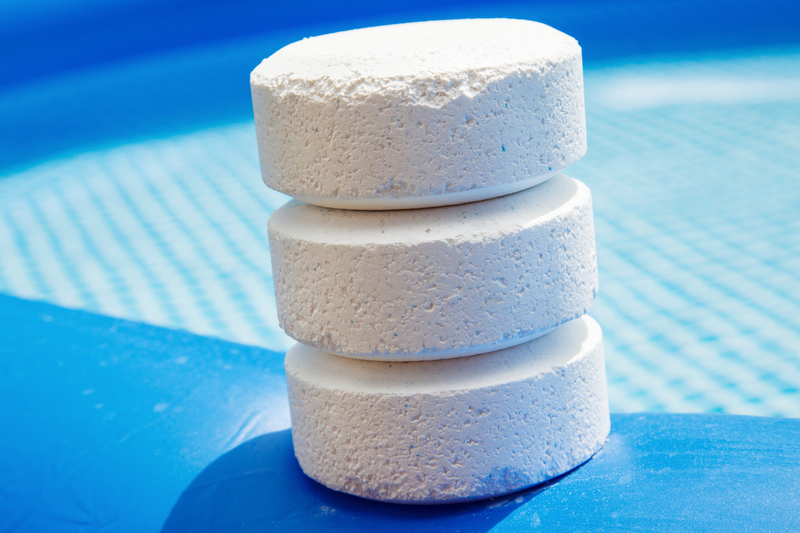 Since tablets are the most common form for dispensing chlorine, determine the size of your pool to find the number of tablets needed. Homeowners can test the appropriate amount of chlorine by measuring a pool’s pH level. The pH level measures the acidity in the water; this level can affect vital chemical reactions occurring inside the pool during the cleaning process. A normal pH level for a swimming pool ranges between 7.2 to 8.0 pH. Chlorine can be very dangerous when misused. Did you know that over 10% of homeowners fail routine pool inspections? It is crucial pool owners adhere to using the correct amount of chlorine needed for the size of their pool. When added to a swimming pool, chlorine reacts with other organic materials such as urine, feces, sweat, and saliva. This creates disinfection byproducts also known as chloramines that have a distinct smell. While many consider clean pools to be bright blue in color, it may actually be a sign of an unsanitary pool. Each season requires swimming pool care and safety. For instance, both winterizing your pool and preparing for pool opening requires the same amount of care as during the summer season. Experts recommend keeping these helpful hints in mind to ensure a fun and safe environment for your friends and family. Chemicals like chlorine can be helpful when keeping a swimming pool clean, but homeowners must use it responsibly. Contact Shoreline Pools to help maintain the chlorine levels in your swimming pool today. How Do I Protect My Pool From Algae?